Volatility is a great method of analysis for binary traders to get acquainted with. While most average traders will shy away from volatility if you learn to understand it and how to apply it to your trading it can lead to explosive profits. In previous postings I have gone over some reasons why volatility is your friend and how to apply volatility to your trading so today I will go over some commonly used indicators. By no means is this a be-all end-all guide to volatility indicators but it is a useful guide into the different methods of measuring volatility and how that information can be displayed on your charts. To quickly touch base, volatility is the measure of movement in an asset and can be current, relative, historical, implied and used to create bands, rays, oscillators and moving averages. Historical Volatility – Historical volatility is a measure of how volatile an asset has been in the past. It is a measure of the standard deviation of prices over a set period and is used to predict how volatile an asset will be in the future. It is natural to assume that a higher volatility asset will have a higher standard deviation and therefore a higher historical volatility, which is true. This is a useful tool because it can help traders determine the amount of movement that is likely to occur. The caveat is that the movement implied by the indicator could be in either direction, not just the direction you want, so it is vital that you do not use this indicator by itself. Implied Volatility – Implied volatility is a projection of how volatile an asset can be expected to be. This may sound a bit like historical volatility but there are differences. It is based on the prices of standard options relative to the price of the underlying asset. I know, as binary traders this doesn’t matter to us but it does, let me assure you. Implied volatility can be used to measure extremes of market sentiment; when implied volatility is extremely high, or extremely low, it can indicate times when the market is about to change direction. The higher the implied volatility, the larger the expected movement can be and vice/versa. Implied and historical volatility can both be displayed as an oscillator or directly on the charts. Relative Volatility – Relative volatility is an oscillator style indicator that measure market movements relative to past price history. It was invented by Donald Dorsey and gives an indication of the direction of volatility. This is important because volatility on its own is merely a measure of movement, not direction. The indicator moves between 0 and 100 on a calculation based on 10 days/bars of data and then smoothed by a 14 period moving average. These parameters can be adjusted to suit your needs but I always like to use standard settings on my indicators. This indicator is a marvelous measure of market strength and should be used as confirmation of other signals such as moving averages or MACD. When the indicator rises above 50 it indicates positive strength, when it falls below 50 it indicates negative strength. 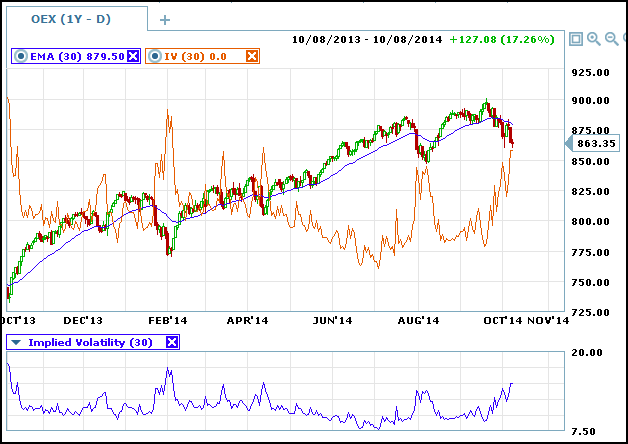 Chaikin Volatility – Chaikin Volatility is another oscillator style volatility indicator. It is a source for debate as it measure volatility as the movement between the open and the close and does not include gaps as other indicators do. Another difference in this indicator is in how it is derived. This one is not based on standard deviation but on percentage movements relative to a moving average of high and low prices over N days. The standard set up is for a 10 day period, smoothed by a 10 day moving average. It is often used to indicate tops and bottoms of trends as sharp increases in the indicator often precede market reversals. The indicator is best used as a confirmation of other indicators as with most tools in this group. It works well with Fibonacci Retracements as well as other trend and support/resistance tools. 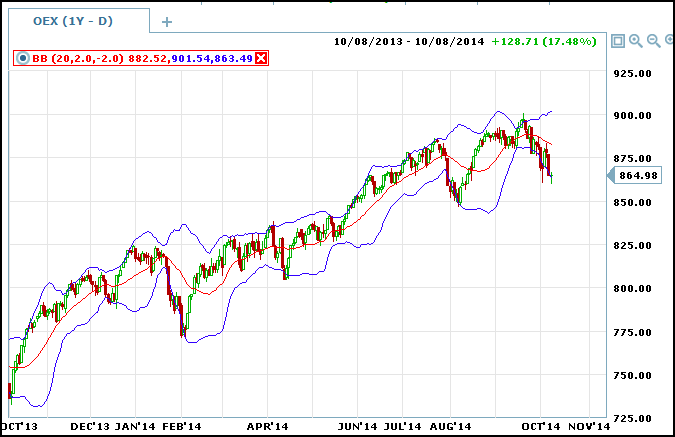 Bollinger Bands ™ – Bollinger Bands ™ are fantastic method of utilizing volatility for binary options. This indicator uses a standard deviation of prices to create a moving average and a pair of signal lines that create a sort of volatility envelope around prices. As volatility increases in the asset the bands will widen, as it decreases they will narrow. Price action will move from one extreme to the other and provide signals along the ways. The indicator can be used to indicate continuation, reversal and for signals like crossovers and continuations. It is by far the preeminent volatility indicator of this group and a top recommended tool for binary traders. It can be used by itself or in conjunction with other indicators and can be applied to charts ranging from 1 minute to 1 day to 1 week to 1 month.